Hey guys!!! 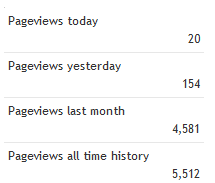 I would just like to take a moment to say thank you to everyone who contributed to my 5,000+ blog views!!! I really appreciate the support and you guys are my motivation.